Last night was Bermuda's Boat Parade, the last official event of the island's 400-year birthday celebrations. The parade began in 1999 and was a much talked about annual event but it was cancelled last year as the event began to lose it's popularity. However that was not the case this year as almost 70 boat owners dressed their boats in a variety of sparkling fancy dress and sailed a catwalk around Hamilton Harbour. It was a colourful sight with boats of all shapes and sizes, with some as long as 60ft following each other in a tight line in the pitch black. Front Street in Hamilton would have been the prime viewing gallery but we went to some friends in Salt Kettle whose back garden looks out onto the water. We had a magnificent view and were just a few steps away from very nice wine and superfluous sausage and mash! Most boats celebrated the 400-year occasion indulging in anniversery regalia. 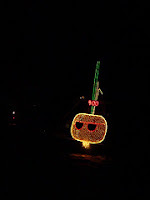 My favourites were the ones that storied the island with the small boat depicting a huge onion (photo) my personal fave. 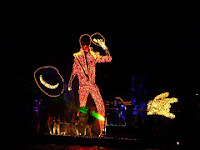 Meanwhile the most extravagant was one owner's nautical memorial to Michael Jackson (photo).